Taiko performance at West Covina Cherry Blossom Festival. 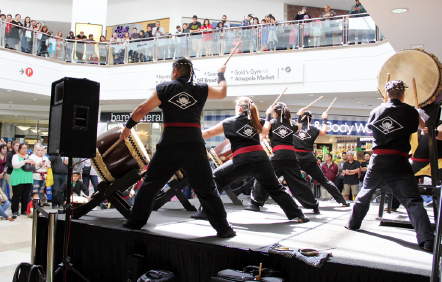 WEST COVINA — The annual West Covina Cherry Blossom Festival kicks-off spring and celebrates the cherry blossom season. This year’s festival will be held on Saturday, March 16, at the Plaza West Covina, 112 Plaza Dr., between Sunset Avenue and South Vincent Avenue. The event is free and open to the public. The Cherry Blossom Festival is an opportunity for the city to welcome residents of the local community as well as visitors from the greater community to gather with the common enjoyment, interest and desire of experiencing Japanese flavors, sights and sounds. This is a chance to learn about Japanese culture, enjoy traditional music and dance performances, watch a judo demonstration, shop a wide variety of countless merchants, and be entertained by taiko drums. These cultural performances will begin at 10:30 a.m. with the last performance at 3:30 p.m. For a complete schedule, visit http://esgvjcc.org. For the past 18 years, the East San Gabriel Valley Japanese Community Center and the City of West Covina have partnered on various projects and programs, including the promotion and preservation of the cultural heritage unique to Japanese American members of the community. The ESGVJCC and the city also sponsor West Covina’s Sister City Program with Ohtawara, Tochigi Prefecture. Funds raised from the Cherry Blossom Festival will assist the Student Exchange Program to occur this summer, as well as the various social, artistic, recreational and educational programs offered at the center. For additional information, call ESGVJCC at (626) 960-2566 or the City of West Covina at (626) 939-8430.